Four full weeks into the Major League Baseball season, the Phillies have a surprise star on the mound. 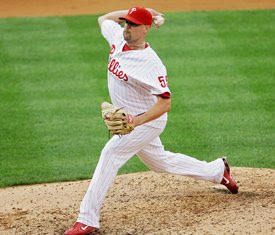 While Cole Hamels, Joe Blanton, Brad Lidge and Jamie Moyer all have ERA's ranging from 5.65 to 8.41. And while Chan Ho Park, Brett Myers, Hamels and Blanton have all combined for just 1 win, righty reliever Clay Condrey has 3 wins, and a 1.26 ERA in 14 appearances. Clay's 0.77 WHIP and .167 batting average against also put him far ahead of his team mates. Condrey has undoubtedly become the most reliable pitcher on the staff. His excellent performance so far in 2009 may not be surprising to some. Condrey's statistics after the all star break last season were quite solid as well. During the 2nd half of the Phils' 2008 campaign, Condrey had a 2.73 ERA in 26 appearances. Not convinced that Clay is worthy of real praise? Still thinking, "Eh, he just looks better 'cause everyone else is off to a poor start"? Check out Condrey's combined numbers against division rivals Washington, Atlanta, Florida and New York in 2008- 35 1/3 innings pitched in 29 games with a 2.29 ERA. And on top of that, in his career against the arch rival Metropolitans, Condrey has appeared in 14 games, pitched 20 innings, and has a 1.80 ERA and a 0.95 WHIP. So, phans, while Clayton Lee Condrey continues to hold it down in the Phillies' bullpen, be sure to give the man his due.